There are two small yet important elements that contribute to the charm of every Tuscan town or city: if you look up, you'll probably notice the uniformity of roof styles in Tuscany, which are rigorously made of red terracotta tiles. And if you look down, or if your feet are sore, you'll be conscious of the uneven cobblestone roads in most historic centers (though some areas have been renovated with flatter paving stones). Both these building practises are extremely old, but still continued in the traditional manner. These great photos of what's above and below us in Tuscany come from Crystal Moon, a study abroad student who recorded every fleeting moment with her camera (you might remember her guest article about learning to slow down in Italy). Crystal generously shared a LOT of photos with me for use on this site. Usually I write articles and then look for, or go out and take, photos to match. This one was developed the other way around - Crystal's photos, the way she seems to always be looking up, inspired me to write about roofs and paving. 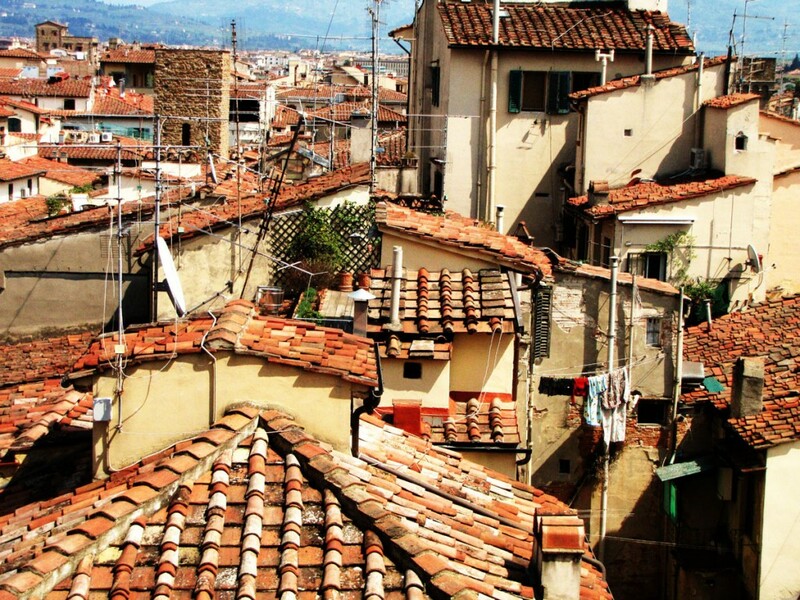 The antique tradition of terracotta roof tiles contributes to the shape and colour of our cities. Slanted terracotta roofs were already used in Mesopotamian times and the tradition continued through the Etruscan, Greek, and Roman ages until the present time with some variation as to the degree of slant and the use, or not, of eaves. 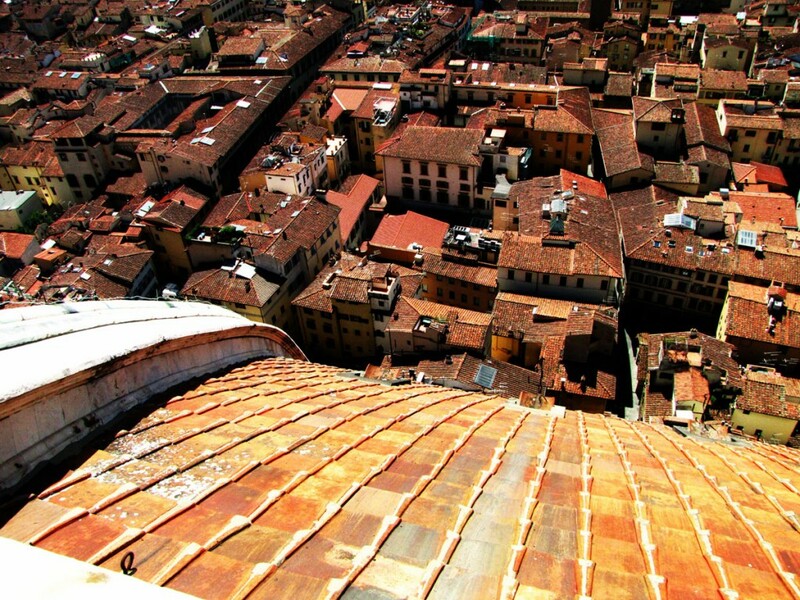 Even the Duomo of Florence has a terracotta roof! Terracotta was also the original material used for the paving of some of Florence's Piazze, such as Piazza della Signoria. Some years back when the city fixed up the paving stones in that piazza, a local terracotta producer even offered free bricks to return the piazza to its original material, but the city refused. Large paving stones are the prefered material for pedestrian areas in Florence, and they are also used on some streets with car traffic, making for a bumpy ride (the #6 bus on via della Colonna may be the bumpiest of all). If you've ever been to Pompeii you'll know that the Romans used very large paving stones indeed, in which we can in some cases see ruts and the channels developed for open sewage and run-off. 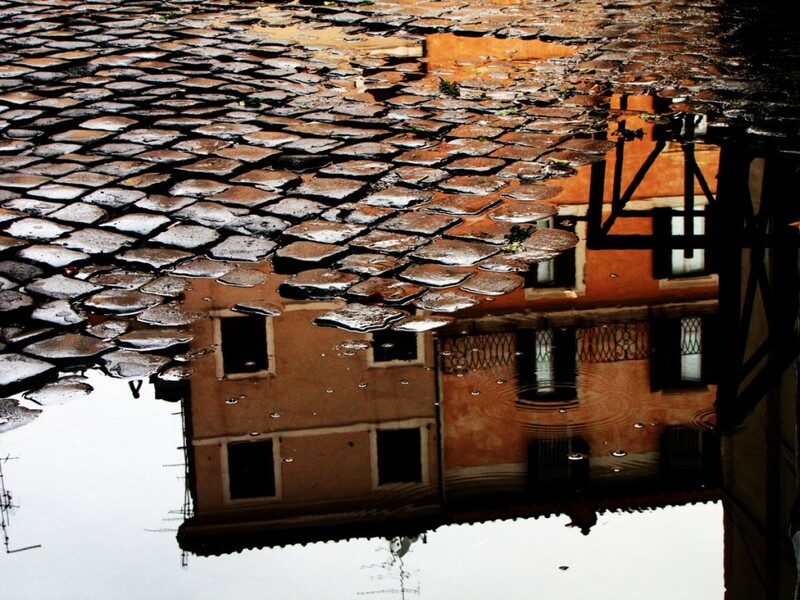 Some towns in Tuscany favour smaller, square cobblestones (the worst for biking and for wearing high heels) - I just love this photo (from Crystal) of the puddles that accumulate on these uneven streets. When in Tuscany, don't just look ahead - look up! and down.